Ulu kite fatu e malu ei koe' - Shelter in the rock for your safety. The focus is on the mui (rock) as the spiritual source of family, language, culture and identity. This will run from Sunday 25 September to 1 October 2016 to coincide with Tuvalu's38th Independence Day celebrations. Tuvalu, means "eight standing together" in Tuvaluan language. The two national languages spoken in Tuvalu are Tuvaluan language and English. Unitec Library has resource both in print and electronic to help you learn and become familiar in Tuvaluan language. Check out the Unitec Library catalogue and our Pacific subject guide. 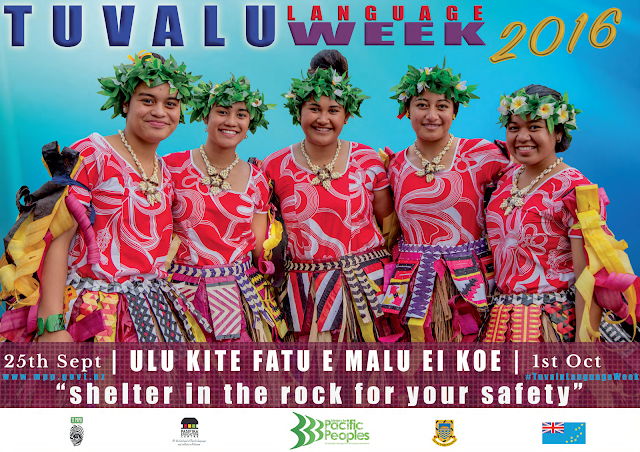 Use the hashtag#TuvaluLanguageWeek to follow the events on social media. Students who complete the survey also go into the draw to win one of two ipads! Winners will be contacted by the library after the closing date. The survey is open to all Unitec staff and students from 12 - 26 September. Referencing and citing – what is it and where to get help? You use an in-text citation in your work which provide a brief information of the source. You provide the complete information about the source at the end of your work, i.e.a reference list or bibliography. Readers of your work can find the original sources you used. Your work has credibility in the larger realm of scholarly knowledge. There are several referencing styles (such as APA, MLA, etc.) and your lecturer/s should have clearly indicated which style to use. You normally use a single style throughout your work. Information on these styles are available on the Library website. Te Puna Ako organizes scheduled and course-specific workshops for students as well as small group and one-to-one help where necessary. You can also refer to the Study Toolbox to find more information. Referencing software can be used to organize and manage your references. Consult your lecturer/s if you need to use them. At Unitec, we support three software: Endnote, Zotero and Mendeley. Endnote is most suitable for postgraduate students. Find out about the great tools for managing your references at the Library. EndNote, Mendeley and Zotero are reference management tools supported by the Library which allow you to store your references, make notes on the resources, automatically generate bibliographies and more. 'Fakakoloa 'a Aotearoa 'aki 'ae Loto 'i Tonga' - Enriching Aotearoa with the Tongan Spirit. Unitec Library has resources both in print and electronic to help you learn and become familiar in Tongan language. Check out the Unitec Library catalogue.